Nepenthes aristolochioides X spectabilis is a Borneo Exotics hybrid between two highlanders. This is the reverse cross of the more available N. spectabilis X aristolochioides. This hybrid is from seed and not from tissue culture like my other BE clone. I grow this cross outdoors as a typical highlander and they are doing well. 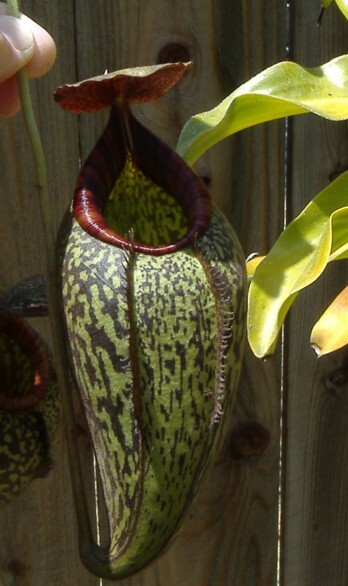 They readily pitcher up and are very vigorous as well. So far the both crosses look very similar without much difference at all. This is a nice hybrid that readily vines so cuttings should be fairly available I would imagine.